In November 1979, British company BSR launched a range of budget-to-mid priced turntables under the ADC brand. BSR was a challenged brand, so it made sense to use the name of the American company it owned. The Audio Dynamics Corporation had a history of making serious vinyl sources dating back nearly two decades, and was at the time a respected manufacturer of quite innovative cartridges and tonearms. Formed by Peter Earnest Prichard in the early nineteen sixties, the Connecticut company invented induced magnetic cartridges, so had a reputation for innovation. The look of the ADC 1500, 1600 and 1700 turntables fed off this – it was clean, modern and almost stark with its satin black finish and red pinstripe detailing. By contrast, BSR was famous for clunky, crude, idler drive auto changers, many of which turned up in budget music centres, invariably festooned in fake teak courtesy of sticky-back plastic. 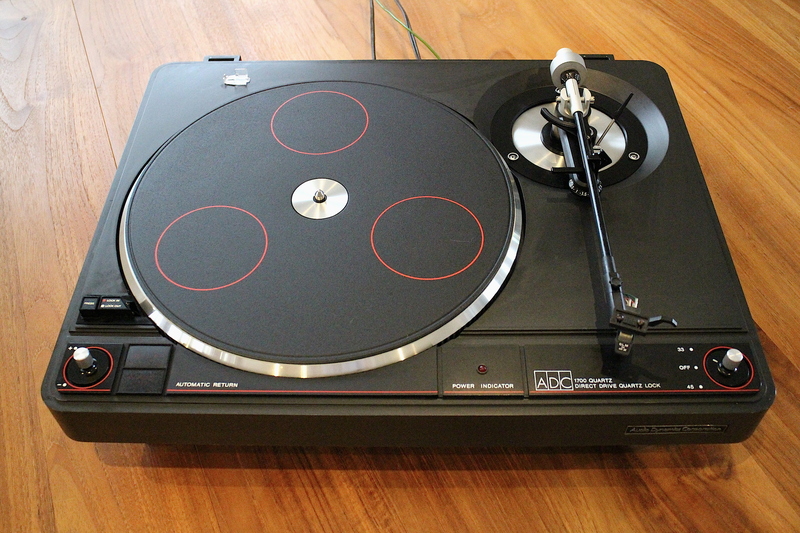 Going with the ADC brand for its new range of more upmarket turntables was a no-brainer. Whereas BSR badged decks would sell for £35-£55, the new bottom-of-the-range ADC 1500 came in at £85. It sported belt drive, manual operation and a fairly high quality Japanese sourced stainless steel tubed, S-shaped tonearm. Bundled was a decent QLM 34 cartridge, which made it look especially keen value. The real action started at £110 however, with the ADC 1600. This had a straight-tube ADC ALT-1 tonearm, which sold separately for around £55, and direct drive operation. It was a big step-up, not least because an ADC QLM 36 was fitted, which again sold separately for £15. The 1700 however was the jewel in the crown, a £130 design with switchable quartz-lock speed control and a £60 XLM Mk III cartridge able to track at just 0.75g – this seemed the very epitome of sophistication. Every new ADC deck used an injection-moulded ABS plinth, lined inside with damping foam. It was reasonably inert, but you’d still call it plasticky by today’s standards. Good quality isolating feet were fitted, but still the 1700 is overly sensitive to placement, and sounds a lot better with its green tinted plastic dustcover removed. The ADC used a 302mm, 1kg, dynamically balanced aluminium platter that rings badly if the supplied rubber platter mat is removed. Inset are stroboscopic markings which work in conjunction with an LED linked to the quartz lock circuit; this gives a sharper visual effect than rivals using neons. The quartz lock system, running at 5.8MHz, was switchable so when defeated the speed could be varied by 6%. The manufacturer claimed a very good 0.03% WRMS wow and flutter figure and a low -70dB (DIN B) of rumble. The ALT-1 tonearm boasted the same open cradle suspension, micron-polished, ball race lateral instrument bearings, carbon-fibre headshell and lead out wires as the LMF series, but with a black anodised aluminium armtube and a different decoupled counterweight design. It’s a low mass design designed for high compliance moving magnet cartridges such as the supplied ADC XLM; a good modern equivalent is Ortofon’s OM10. Sonically, the ADC 1700 is a good performer, but nothing special. It looks better than it sounds, basically. The main issue is its inability to deal with airborne and ground-borne vibrations; if you place it well then things take a turn for the better with a pacey, propulsive sound, with a fair smattering of detail. Partly because of the tonearm however, the deck lacks weight and grunt; it tracks smoothly but can’t serve up the power of price rivals like the Rega Planar 2 of its day. The midband is a little thin and two dimensional, although it is spacious left to right. Bass is crisp and treble well defined, although again lacks real insight. A decent little deck then, but the main thing going for the ADC 1700 nowadays is its style and low price – it’s possible to bag these for as little as £50. At that price, they’re great value for money. Great info – as you may know BSR marketed these under the prefixed `Quanta’ range – (not quite identical to the ADC range). The belt drive Quanta 600 sounds very good indeed . They don’t sound very good (shame) for I really, really love the looks of the 1700! Also it was much thicker than most photos tend to show. The diagonal pictures and those from the top always made them look slicker and slim. I expect that’s all it will take to make it new again.